This gracious, 1830âs-circa Federal style home is being brought to market as a thorough and masterful renovation orchestrated by Andrew Kotchen, principal of the prominent New York City architectural firm, Workshop/APD, and frequently featured in Architectural Digest - most recently in March 2018. 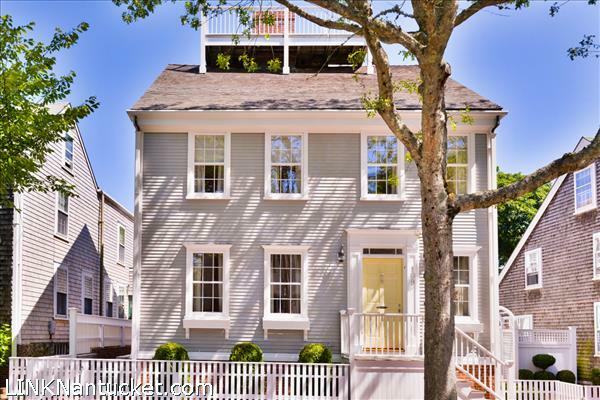 Impeccably maintained and in pristine condition, this offering represents an opportunity for a discerning buyer to own a five bedroom, five and one-half bathroom home on Upper Main Street, unarguably the most prestigious address on Nantucket Island. Beautiful custom work, magnificent craftsmanship, an overriding respect for the historic integrity of era and place, and modern amenities - including commercial art gallery lighting throughout the house - are among the hallmarks that enhance this lovely home and make it a must see for the buyer desiring the very best. The house is sited well above street level and, as is typical with the Federal style, the faÃ§ade is elegant in its simplicity. The front elevation is clapboard (this is painted in a high sheen muted gray), with side and rear elevations shingled in the true island tradition. Perched on the hip roof is a widowâs walk, where views of the historic neighborhood can be enjoyed. Fully sound proofed, occupants enjoy this prime location on Main Street without being disturbed by passersby. Clearly, no expense has been spared. Please send me more available listings similar to 109 Main Street, Town. Thank you!